I already had a skirt that I liked the look of, but didn’t quite fit me in the waist the way I wanted. I decided for this skirt I wanted the elastic band to sit at my natural waist and be snug, but not snug enough to cut off circulation. Next I went to Pinterest to find any tutorials that might be similar to what I was looking for, and found this one at Out of Order. A lot of what I did is very similar, but there are a few steps that I made more clear for someone who may not be familiar with sewing. 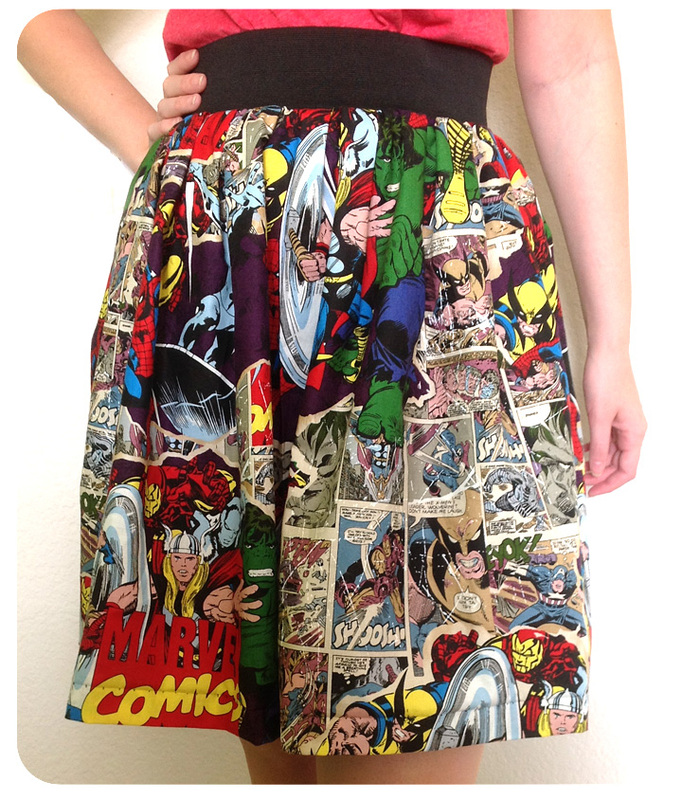 The great thing about this skirt design is that it’s literally two rectangles sewn together. If you do have a larger waist size, you can just add another rectangle and sew that in as well! First thing’s first, since I wanted my skirt to sit at my natural waist, I measured down to where I wanted the skirt to sit. Personally, I like longer skirts, so I wanted it at just above my knees. However, I’m pretty paranoid when it comes to measuring, so I added 2 inches to the bottom so that I could hem my skirt later and be sure it was long enough. Once I folded my fabric in half, matching the top and side edges together, I measured my length (in this case 22 inches). I then cut the fabric so that I was left with two rectangles the same width and length. After that, I followed the directions in the tutorial, and measured and pinned every 2 inches across the width of the fabric. The reason you do that is you’ll be pleating the top so that you can gather it into your waist band. If you’re finding that pleating every two inches isn’t quite wide enough for your waist, you can adjust the size of the pleats (maybe every 1.5 inches instead) or just add another rectangle. Now starting with the first pin (not the edge), bring it over to the pin next to it, and pin those together. Move to the next pin, and repeat until your whole piece of fabric is pleated. If you have some left over fabric at the end, that’s fine, you’ll cut that off later. Repeat this with your other piece of fabric. Next, sew a straight stitch along the top of the pleats so they’ll hold together. 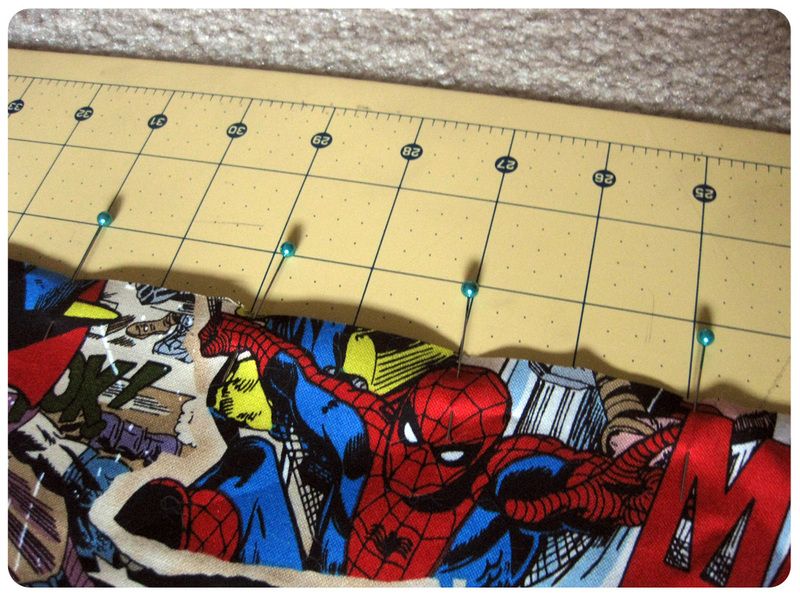 To determine how wide you’ll need your fabric pieces, you’ll have to use your elastic. Since I wanted a tighter fit on the elastic, I cut a piece that was 1-1.5 inches smaller than my waist size. Depending on the amount of stretch your elastic has, you might want to adjust that number. I pretty much just stretched it around my waist and tested what felt right. After that, you’ll want to sew your elastic together using a stretch stitch. Here’s the important step. Once you have your elastic sewn together, lay it on it’s side and measure. 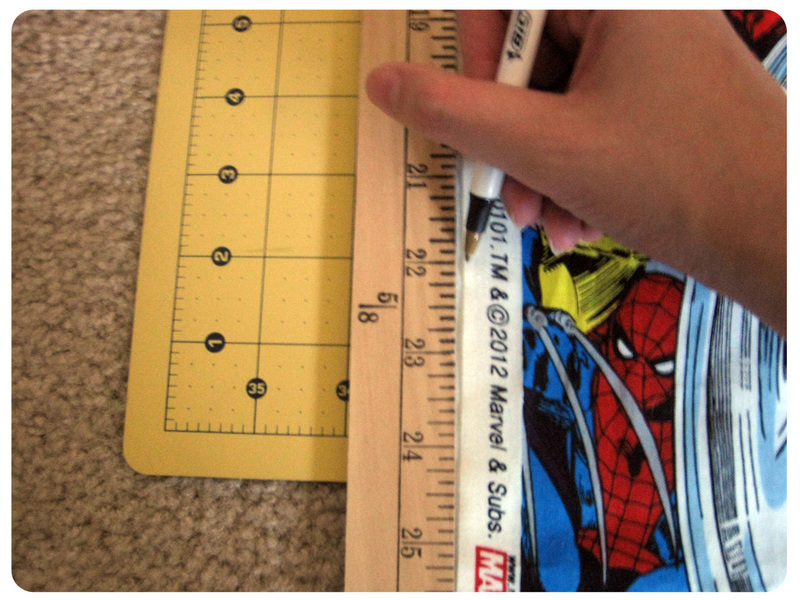 Here, my elastic is roughly 13 inches. Now, take that elastic and stretch it out as far as you can (you may have to stretch it a few times). The length you get after you stretch it is how wide you want your pieces of fabric to be. In my case, my elastic stretched to 21 inches, so I cut each fabric piece to be 22 inches wide (one extra inch for seam allowance). Next, sew the sides together. 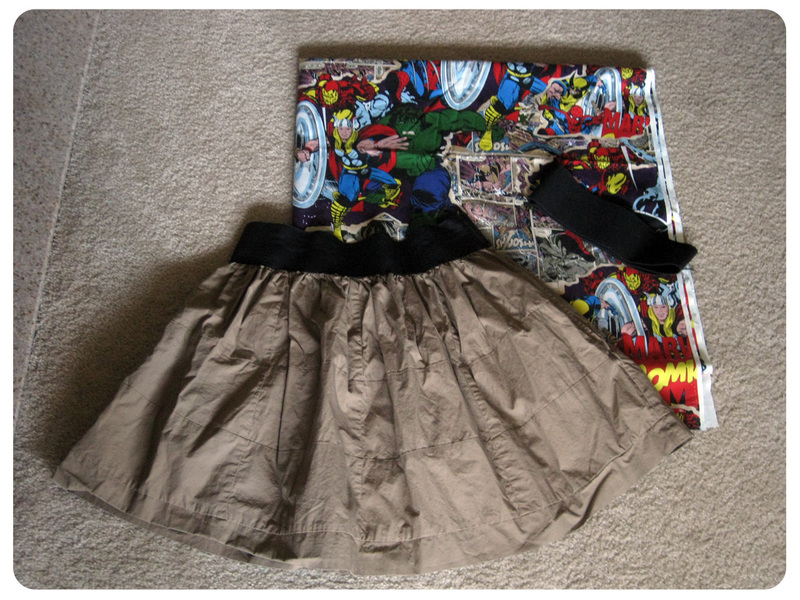 After my fabric was sewn together, it was starting to look more like a skirt. However, since the waist at this point was much bigger than my own, it was time to pin the fabric to the elastic. I started out pinning the front, back, and sides together making sure that the “right” side of the fabric and elastic were facing each other. I then added extra pins along the waist by folding two points together and pinning the center. I continued doing this around the skirt until it was pinned evenly. This next step was pretty complicated, and I had to rip it out a few times, so my advice is TAKE IT SLOW. If you have your elastic and fabric pinned together, you may notice that the elastic seems smaller than the fabric. We fix this when we sew them together. Once you’ve made a few starting stitches, you then stretch the elastic to match the length of the fabric. After the elastic was sewn in, I measured the length again and pinned where I wanted the hem to sit. 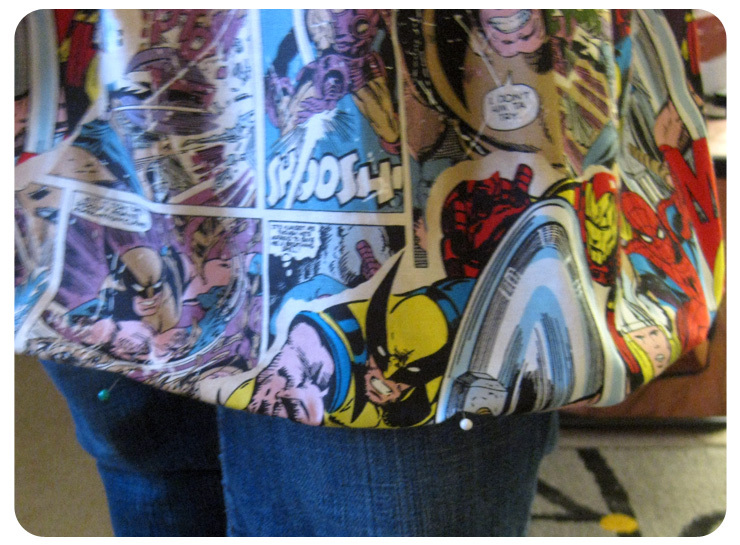 I made sure to iron around the bottom of the skirt (a tedious, but necessary step!) and then folded the top under and ironed again. This way, you won’t have a raw edge showing. I then used a blind hem stitch to finish off the hem. If you don’t have a blind hem foot, or you feel this is too advanced, you can use a double-turn hem which is pretty much a straight stitch along the bottom. I hope you enjoyed the tutorial and give it a try! 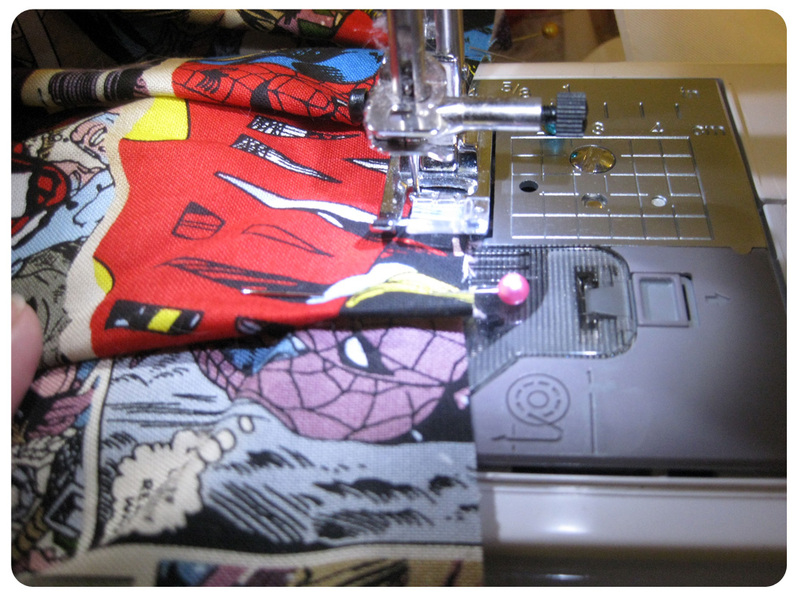 This is a great project if you’re new to sewing or even if you’ve been sewing for years. 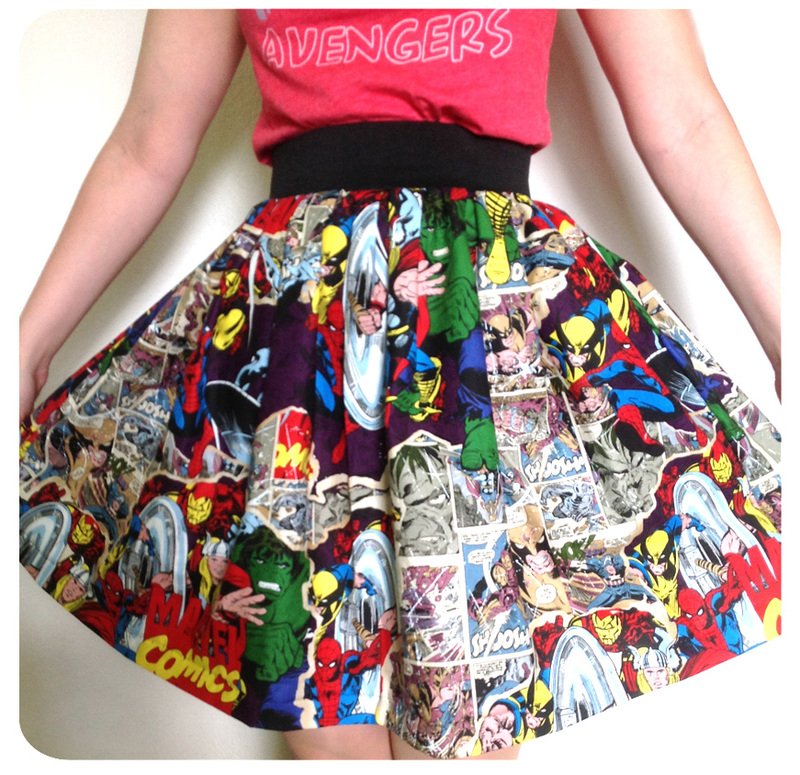 I don’t own many skirts that fit well, so it’s always nice to know that I can make something that will fit PERFECTLY. 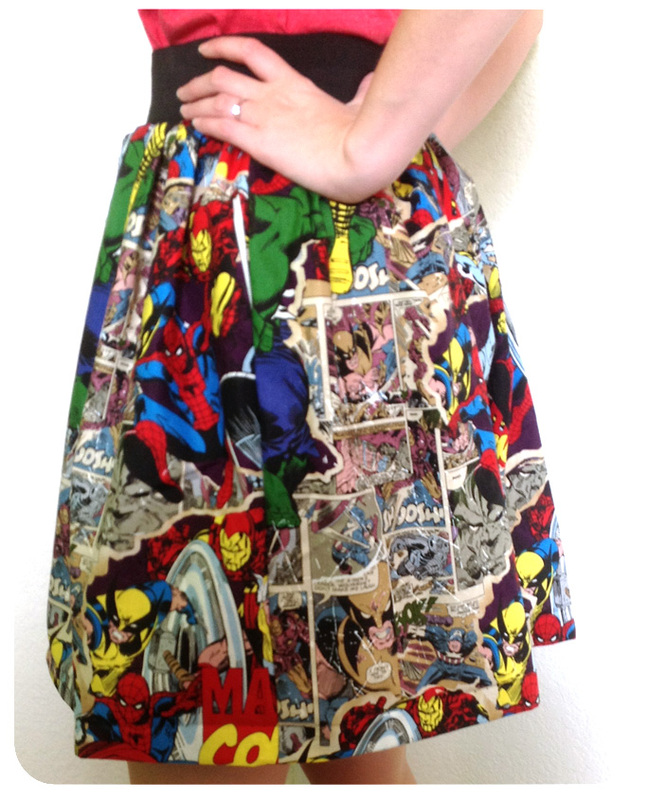 It also doesn’t hurt that I can make as many geeky skirts as I like! If you have any questions, or want something explained better, post in the comments or on our Facebook page. We also welcome you to post any skirts that you make using this method! How many yards did you use for this? I know you mentioned the length but I didn’t see anything like a measurement for the width of the fabric before you pleated. I bought 2 yards of fabric and ended up using about a yard and a quarter. For the width, I actually used the width of the fabric which I believe was 45″. So the yardage was used up in the length. I mostly did this due to the way the pattern was oriented. I hope that helps! That does help! Gives me a good idea when going to get my own fabric. Can you let me know the item number for the fabric? My Joann doesn’t have it and I want to see if I can order it. Sorry it took so long to get back to you, I had to find my fabric. The style # is 13020101. Hope that helps! Thanks so much! Hopefully I can find it!